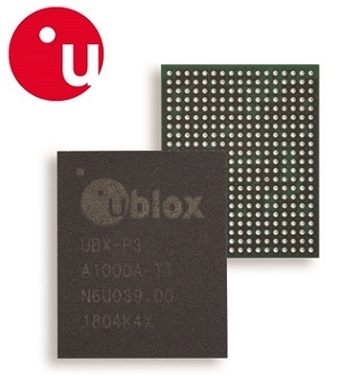 u-blox has introduced its UBX‑P3 chip for vehicle-to-everything (V2X) wireless communication based on the DSRC/802.11p standard. The chip builds on the success of the u-blox THEO‑P1 and VERA-P1 V2X modules, and the company’s experience as a technology supplier to the existing V2X chip industry. Developed entirely in-house, the UBX‑P3 takes u‑blox’s commitment to shaping the future of active safety and autonomous driving technologies to the level of industrialization. Driven by demands for reducing traffic accidents and optimized traffic management, V2X technology leverages wireless communication for vehicle-to-vehicle (V2V) and vehicle-to-infrastructure (V2I) communication, giving all vehicles on the road a shared real-time perception of their surroundings. In addition to increasing road safety, V2X technology improves traffic management and enables wide-ranging applications such as truck platooning as well as in areas including smart cities, mining, and agriculture. UBX‑P3 communicates via the IEEE 802.11p wireless standard, referred to as Dedicated Short Range Communications (DSRC) in the USA. The DSRC/802.11p technology is mature and available for immediate deployment of V2X systems. Many automotive tier-1 suppliers are developing DSRC/802.11p based solutions. Car and truck OEMs have either deployed or plan to deploy the solutions commercially in the near future. Offered in a compact 9 x 11 mm form factor, the UBX-P3 supports various design options for flexible deployments in the vehicle and the road-side infrastructure. The UBX-P3 concurrently communicates on two channels, which means that safety and service messages can be processed continuously providing greater safety in traffic. Alternatively, it can be used to enable the chip to simultaneously communicate on the same channel using two antennas, thus providing vehicles full coverage with no blind spots. As the market leader in automotive positioning solutions, u-blox has a two decades of experience working with the automotive industry’s quality and supply requirements. UBX‑P3 is designed in accordance with these stringent demands and complements u-blox’s portfolio of automotive grade positioning, cellular communication, and short range radio technology.